In the middle 50s I got to hear George Bennard and his wife sing The Old Rugged Cross in my home church in Downey, California. Hubris? You better believe it. To my young imagination, it was like hearing the Apostle John recite the book of Revelation. It is one thing to READ or SING some Christian iconic hymn, but to hear the composer sing it with his wife-- that is truly authoritative. George Bennard was a pastor in Michigan before he was well known as the author of the hymn, but George was never spoiled by the notice he got. He was common as an old shoe. "The Old Rugged Cross" has to be one of the world's favorites. When my wife and I were on deputation to go to Ethiopia as missionaries in 1972, we met George's wife in the foyer of Grace Bible Church in Grandville, Michigan. She was so gentle and sweet, and she handed us a cash gift for the work. She was in her 90s. I nearly cried. The gift was amazing for a lady undoubtedly having some issues with inflation and her inheritance, but I love my Lord intensely for those few priceless moments along life's way when he let me have memories 99.9% or you could never have. These are all mine in Christ. I cannot share them other than to tell about them. This is why you need to prod those old geezers you meet around town. They have a few choice stories to tell, and they usually will not do it unless you really want to know. If you want to hear more of my own private yarns from life, GO HERE. But, I want to take just one liberty with "The Old Rugged Cross." I hear of folks who don't like to sing it because the chorus says, "I will cling to the old rugged Cross..." We too were bothered with the "cling to" part. It sounds a bit Roman Catholic. I know George didn't mean it that way. He was a real Bible believer, but a change would be in order. So we sing, "I will sing of the old rugged Cross..." Hymns are NOT inspired, so we can change them. We do it all the time, especially with some of these light weight choruses in the chorus books. If you won't change a hymn to come in line with the Word of God, you are treating the hymn writer like an inspired revelator, rather than a fellow servant. George Bennard would not complain anyway. There is no Cross in heaven, where George is, to cling to-- just the only man-made thing in heaven-- the scars of the nails in his hands. To that I shall one day cling. Editor: My Dad, Wesley Van Nattan had almost the same exact experience. He told me many times that he loved his Dad intensely. My Dad was the youngest of five kids, and my grandfather become conscious that he had worked hard all his life and neglected his kids-- he came to this mindset about the time my Dad was about 14. So my grandfather, a mighy Dutchman with a fierce work ethis, spent a lot of time playing ball with my Dad and talking to him. My Dad worshipped his father. Problem-- my grandfather was a godless man, and my Dad was determined to be just like his Dad. My Dad tells stories of a very rough life of survival during the Great Depression. The house was nearly foreclosed over and over. But, he dropped out of school and worked so much that my grandmother made many entries about my Dad and how she worried that he would ruin his health because of his long hours working. He saved the home, and he kept house, cooked, and cleaned, and did all the work my grandmother could not do-- she was invalided with severe arthrutis. Learn how the Lord gave my Dad another Dad who lead him to the Cross and the Savior. 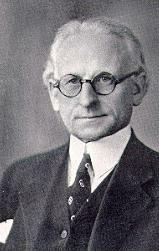 In 1895, across the state in Canton, Bennard attended Salvation Army meetings, and at 24 became a minister when he enlisted in the Salvation Army at Rock Island, Ill. By 1898, he was conducting revival meetings throughout the Midwest, later transferring to New York, where he resigned in 1910 to go out on his own as an evangelist. It was at that time that he began composing hymns. Bennard settled at Albion, Mich., and opened his own hymn publishing company. It was at Albion that he likely began - and later finished - "The Old Rugged Cross." The hymn was first sung formally at a revival meeting at Pokagon, Mich. Noted evangelist Billy Sunday, an Iowa native, popularized the hymn with his nationally broadcast radio show. By 1939, more than 15 million copies of the hymn had been sold and numerous recordings made. He died in Reed City, Michigan, where the local Chamber of Commerce erected a cross near his home. Bennard is buried at Inglewood Park Cemetery in Inglewood, California. Editor: My God fearing garndmother was buried in Inglewood Cemetary..... a feel good moment. 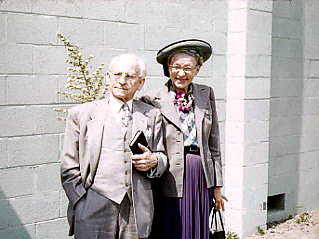 George Bennard and his wife. Brother Bennard wrote the hymn, The Old Rugged Cross. This photo was taken in Downey,California in about 1953. You are welcome to copy the photo which we own. Video of the hymn is sung by the Salem Singers of Oregon. �Who will go and work for Me today?